If you get into the habit of beating yourself up after a poorly struck shot, you’ll begin to fear your own criticism and increase your performance anxiety when you are down on a shot. It is very important to have a triggering mechanism that gets you back into a positive state after you miss. This could be a positive phrase that answers any negative thoughts you might have, a deep breath or a highly developed post-shot routine. Whatever it is, the key is to recover quickly so you don’t let it set in and affect your mood the next time you approach the table. You’re much more likely to play your best game of pool during an actual match. The reason for this is that most people need to be aroused to a certain level, which will increase your level of concentration. Be sure to remember this next time you feel nervous. A case of the “nerves” can actually be a very good thing! Giving yourself mechanical feedback diminishes your confidence because you are essentially admitting to yourself that you have doubt about your pool stroke. The key is to concentrate on your pre-shot routine and do your best to execute each shot subconsciously. After all, practice time is when we should focus on our mechanics…not during match play! 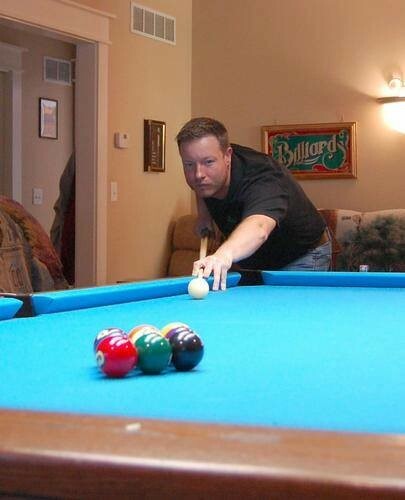 Visualization is an important part of playing pool well. Have you ever been amazed when you made some sort of miracle shot? This kind of execution is most likely the result of being forced into developing something creative. Most of the time when we are forced into a bad situation we tend to develop a very clear image of the shot we are trying to execute. Make sure that visualization is a key part of your pre-shot routine on every single ball. Make the “process” of stroking each ball become your goal for the tournament instead of the number of games you plan to win. This basically translates into making your pre-shot routine your number 1 priority. Going to the table with the goal of winning 7 games, only creates pressure. If winning 7 games is your goal, what happens when you lose the first 4 games? When focus on the process, you shift your attention from what is out of your control (the score), to something that is 100% within your control (the process). This will take the pressure off of your performance and increase the chances of winning the match. One of the keys to becoming a better player is to play your matches in the present moment. When you move focus on the past, it has a negative effect on your game. Let’s say you just ran 9 racks. Where is your focus likely to go after that? You will probably think about all of the success you just had. Quite possibly, this might increase anxiety and could cause you to lose your upcoming match. The same thing happens when you miss an easy shot. Remember, it is very important stay present so that you can remain in a calm physical and mental state.